Who else has a Halloween hangover? We had a great day here, after not being able to celebrate the past two years due to unusual and awful weather conditions. Lots of candy in this house = dangerous! And now, it’s time to start focusing on Thanksgiving. This dessert is perfect for those who are looking for something EASY and FAST. Too busy prepping the rest of the meal? No room in the oven? This is for you. Beat cream cheese, pumpkin, sugar and pumpkin pie spice on medium speed until well blended. Gently stir in 2 1/2 cups of whipped topping. Refrigerate remaining topping for later. 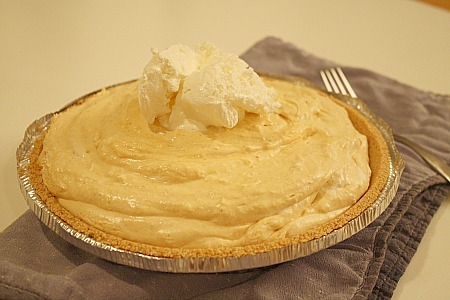 Spoon cream cheese mixture into crust and spread evenly. Refrigerate 3 hours or overnight. Serve with remaining topping. Store leftovers in refrigerator. 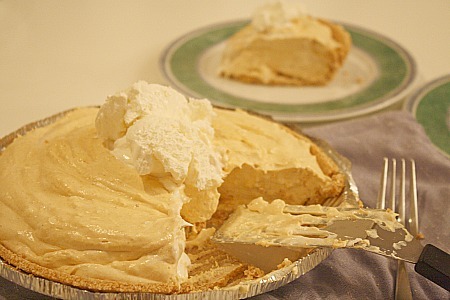 This entry was posted in cream cheese, dessert, freezer friendly, make ahead, pie, pumpkin, QuickAndEasy. Bookmark the permalink.